Join the $40K in 40 Days Challenge! Update: Thanks to generous early support, we have secured an additional $10,000 in matching funds, raising our challenge to $50,000 in 40 days, or $100,000 in total support. Thanks to all who are making a difference with their gifts! 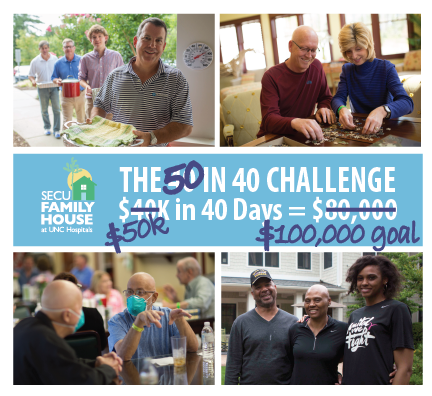 During the next 40 days, generous friends of SECU Family House will match every dollar you give to our annual fund until November 29, up to $40,000. This “challenge match” means your gift can help raise $80,000 to make Family House a home for families who travel to UNC Hospitals for medical care. Here's how to donate online: http://www.secufamilyhouse.org/donate-now. Raising $80,000 will cover the cost of nearly 1,000 nights. To inspire this effort, over the next 40 days, we will count down to November 29 with 40 reasons Family House is so special to our community. Watch our social media pages (Facebook, Instagram and Twitter) for updates to our countdown, and please spread the word using #FH40in40. What are the reasons you will support Family House? 40. Generous donors who issue a challenge! 0. The challenge ends on #GivingTuesday, November 29. Please donate by November 29 to help us meet the challenge, and double your impact! Donate online or see other ways to give!